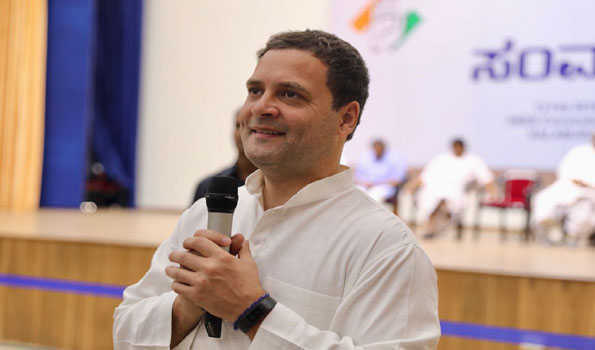 Kalaburagi: AICC President Rahul Gandhi, who is on a whirlwind election campaign tour of North Karnataka ahead of Assembly election due in May, on Tuesday said if the Congress Party is voted to power post 2019 Lok Saba election, it will reform the current GST tax regime to get relief to people across the economic strata and bring a single tax regime.Mr Gandhi accused the BJP government of pushing through 'an untested GST system on 1.3 billion people of India which has now proved to be a disaster. The people were left to suffer', he added. In an interaction with business personnel and professionals at a meeting here, he said his party would remove confusion under the new tax regime.He assured businessmen that when Congress come to power it will simplify GST that was introduced by UPA government with right earnest and forward looking focus for the country. The party was aware of the problems of the person who drive the economy and will provide them reliefs that is in tune with National Development,which the BJP government 'had failed to understand', the Congress President remarked. 'I want to explain here that the UPA government wanted to bring GST regime to simplify the lives of the people, but the BJP complicated it. What the country needs is one tax and the interests of poor sections of the people, outside the GST, are taken care of. But, now, it is not to be. We will cap the GST at the higher level of 18 per cent,' he claimed. Mr Gandhi blamed the BJP government for not heeding to its demand for a simplified GST but insisted on a five-tier tax structure. He further said the Congress had told the Union government to go for a pilot project before implementing the GST. But not heeding to opposition, the BJP government implemented it and one can see its ill-effects on the economy, today.